We want our products to delight you. If you’re dissatisfied for any reason, with a shipped product return your order within 30 days for a full refund (excluding e-books, and all digital downloads, such as classes and tutorials, and shipping and handling). It must be in new, resalable condition. NOTE: You must receive prior authorization for a return of merchandise before a refund can be issued. Please email us at connect [at] sharonsayler[dot]com. Refunds generally take 2-3 weeks once we have received and processed the returned item. We will credit your card for the full amount less shipping and handling. We absolutely guarantee that your order will be transmitted securely and that you will pay nothing if unauthorized charges ever appear on your credit card as a result of shopping here. We stand 100% behind our products and programs. Our guarantee is as strong as we can make it. We guarantee the quality and quantity of the information you will find here. However, we cannot guarantee your success. That is your responsibility. We feel certain the information and resources provided through or by COMPETITIVE EDGE COMMUNICATIONS, LLC can help you, yet you are ultimately responsible for your own success and your own failure. For this reason, we can only guarantee the quality and accuracy of our information. We can’t guarantee your performance or your success. Please don’t join the COMPETITIVE EDGE COMMUNICATIONS, LLC community if you are expecting a “magic-bullet” for your success or if paying the fee for products, coaching or consulting means that you don’t eat or pay the rent or mortgage this month. Developing your leadership, relationship and communication skills takes dedication, flexibility, perseverance, and creativity. If it were easy, you wouldn’t be so overwhelmed and scattered in your own search for the right way. When you devote time and energy into developing the skills you need and/or those you are best suited for you will reap rewards in the form of satisfaction, meaning, advancement and possible financial reward. 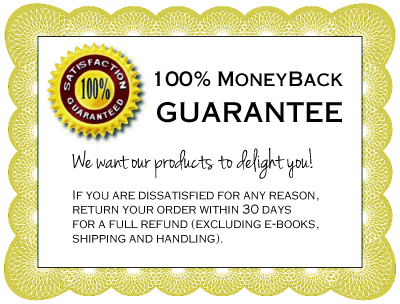 Products Guarantee: Should you wish to return your product you may return it within 60 (sixty) days from date of purchase provided it is in excellent, ‘resaleable’ condition (no tears, handwriting or doodling on pages, no stains, etc.) To get the return process started, please email connect @sharonsayler.com. We will give you the address for returning your product. Download Products Guarantee: Downloadable products are not refundable because purchasers receive an instant email to download the product. However if you are truly dissatisfied with the product and you can honestly tell us that Competitive Edge Communications, LLC did not provide content of sufficient quality, we’ll refund your money on a case-by-case basis. The final decision is at the discretion of the management of Competitive Edge Communications. Online Training Programs Guarantee: We offer a guarantee for our online and/or online group training programs, webinars, or teleseminars! We love seeing people succeed and it is important to us that the program you are enrolled in is the right one for you. If after the first call or online event you realize this opportunity is not for you, email us at connect @sharonssayler.com and we will refund your money, or if YOU take ALL the action steps presented over the full program, show up for all the calls, and implement a minimum of three strategies, but you are not happy with the program and do not see any improvement, then we will refund your money and let you keep all the bonuses! Your commitment is important to the success of any Competitive Edge Communications offers and/or any program and there are no refunds for non-participation. Coaching and Consulting Guarantee: Our private programs or custom events are only an educational and/or business consulting service. Client accepts any and all risks, foreseeable or unforeseeable, arising from these transaction(s). Presentations Guarantee: If you are not 100% satisfied with Sharon’s presentation to your group, let us know within 3 days after the presentation and we will cheerfully refund any fees you have paid to her. Expenses such as books, products, food, airfare or hotel expenses are non-refundable. Our primary shipping service is USPS, FedEx Ground or FedEx Home Delivery. All are “ground” services take 5-7 business days, coast-to-coast as most of our products ship from our primary warehouse in Portland, OR USA. Availability – Every product detail page will show a value similar to “Usually Ships in 2-3 days”. It is also noted in the Shopping Cart, and informs you of how quickly an item will be ready to ship out. For example, some items will ship within 24 hours, others in a couple days, while some may take as many as several weeks (especially custom products). The “Availability” value is an estimate. We do our best to ship items out as quickly as possible, so we often get orders out more quickly than is noted by the “Availability” timeframe, but please do not count on that. The method of delivery – our shipping method is either USPS or FedEx Ground (commercial addresses) or FedEx Home Delivery (residential addresses). FedEx Express Saver takes 3 business days; 2nd Day Air is two business days, and there are several options for Overnight delivery based on the time of day to be delivered. We charge for shipping including 2nd Day Air, Overnight delivery and International Shipping. They are not free. Additional charges will apply. Additionally, please note that delivery time is also based on ‘business’ days. For example, if you place an order on Sunday, it’s impossible for us to ship an item the same day as all the shippers are closed. Free Shipping Offers: On occasion, we offer special promotions with free shipping. Free shipping promotions are available for continental US domestic shipments only. Calculating Cost: We do not profit from shipping. Should you ask for rush shipping, or if we’re shipping your order internationally, your shipping cost will be exactly the same as we are charged by whichever shipping company is used to deliver your package. Shipping costs are calculated on the website automatically during Checkout based on the weight of the items you are purchasing. Signatures for Delivery: Typically, we do not require a signature when we ship your package. However, there are instances when the delivery driver may decide to choose this option, which is at their discretion.